Have you ever had someone give you a compliment that doesn't make you feel very good at all? One that actually feels more like a criticism? I suppose people think it's okay to comment on someone's weight when they have a petite figure, but still... There are nicer ways to comment on someone's appearance than with a poorly hidden insult. Here's my point: let's be nice to each other. 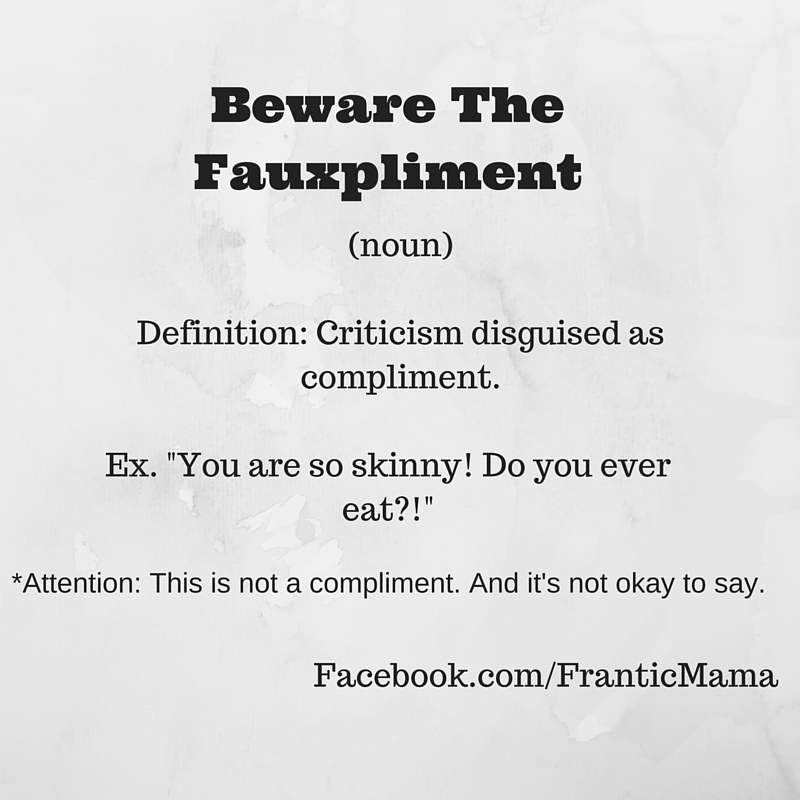 Let's resist making passive aggressive "compliments." Let's stop feeling like it's our business to talk about someone's weight, appearance, etc. Better yet, remember the gem, "if you don't have anything nice to say, don't say it at all?" Yeah, let's do that. What about you? Have you received any of these "compliments" recently? I know this! oh! Thank you for giving it a name!! I often get told, 'You painted this?!' and then always always followed by," to pass your time at home?" O yeah, really? The problem is I never realize it in the moment and then keep hurting for long after!! What is it with people? I am never the one to retaliate and have often wondered ,'what ails me?' Thank you for the diagnosis! you are genius!! It can hurt me for a long time after the comment is made too. I suppose a cruel remark can occasionally be blamed on misunderstanding, but all too often, I think people make hurtful comments in order to make themselves feel better by putting someone else down. Sadly, bullies can be grown-ups too!